Pereira is the Pearl of the River Otun, also known as the City Without Doors. Unfortunately, many people we have encountered in our Colombian travels often have never heard of Pereira. It’s a biggish small city and the capital of the coffee region. A center of commerce and production, it is very progressive and modern compared to other parts of Colombia. We have agriculture, hydroelectricity, and beautiful views. It’s a place for people who love nature, with hiking and camping only minutes away from the city center. With your support Pereira City Guide can grow into our market niche and bring our readers MORE information, MORE frequently and with MORE accuracy! Our Mailing List and FREE eBook for “Pereira City Guide” will provide you with new articles, plus an interactive take-the-info-wherever-you-go type of experience. We frequently offer this eBook for FREE via Amazon Kindle Promotions – to help ensure max engagement. We now offer the eBook FREE when you sign up for our mailing list. Download your copy now! Pereira City Guide (dot) com is publishing frequent blog posts which are documenting the destinations, attractions and services that Pereira has to offer visitors. We are the only English-language website of its type and many of our topics have never been written about before. High Quality Content, bringing readers information about local shops, restaurants and cafes. We come to you and take pictures, interview as needed, write gobs of notes, and craft creative curated content which will show your local attraction or business in a positive light. We won’t make things up, but we will report with accuracy and guarantee good performance. Business Pages are helping local businesses of good value and service to connect with potential visitors and offering bonuses and discounts to page viewers who share a business page via social media. Locations are shown via Google maps too. We are so grateful for all our readers, your comments, likes, shares and participation. Thank you for your love and positive energy. Meet Erin Donaldson. With a background in agriculture, particularly horse-management and show judging, writing was an unexpected career turn. In her home country, Erin had faced the challenge of limited opportunities – especially in agriculture. It was time to do something different! She quit her boring dead-end sales job, sold everything (even her beautful show saddle), and went to South America. Her first foray into the world of blogs and websites was in 2012, and started with her first blog www.openmindedtraveler.com . One day, she realized that there really wasn’t a local authority on tourism and information, in English. And that idea turned into Pereira City Guide.com. Together with some consulting from European web developer Phill Wess, Erin carefully planned Pereira City Guide (dot) com, as a small blog – with huge potential. Today, Pereira City Guide, is becoming a household name, as locals, expats and visitors discover the value of high quality and accurate information about our beautiful city. Today Erin is a professional Freelance writer, Amateur Journalist, Blogger and Influencer. 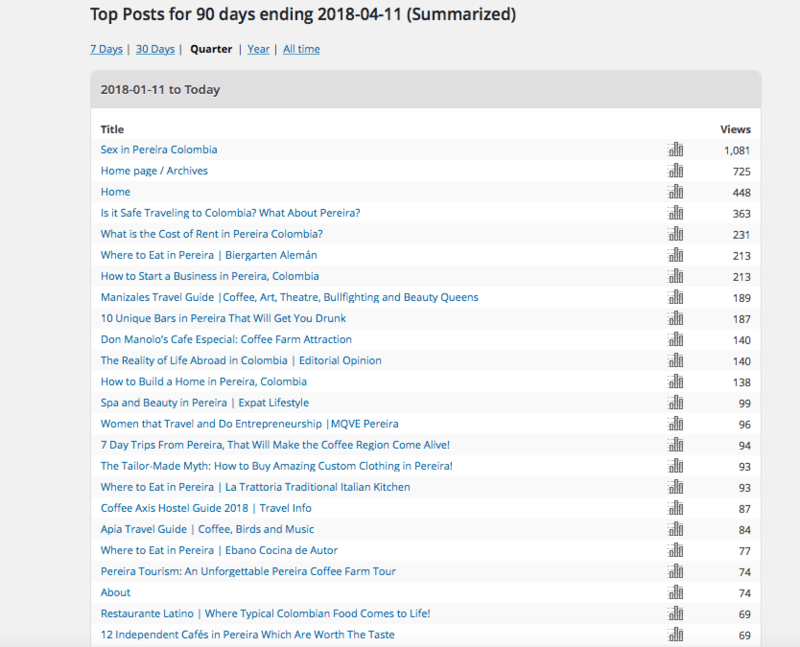 Articles published in print and online media, and include publications like:Colombia Reports, World Nomads, KimKim.com, International Living Magazine, Steemit.com, PereiraCityGuide.com and OpenMindedTraveler.com. Media Appearances: 2016 TV Reality Show Mochileros Participant, 2017 Appearance by Invitation on “Entre Mujeres” Telecafe interviewed about PereiraCityGuide.com. Articles Writing/Travel Blogging/Online and Print Publications/Graphic Design/Slideshare/Social Media/Influencer. 2018 La Voz de Los Andes Radio, Radio Caracol, Canal Cnc Regional and more. Become a Content Sponsor and help spread the word about your positive message, local business or quality product! We have a biggish small website which is the most well-positioned travel and lifestyle blog in Pereira. Produce new content every week when you sponsor a blog article. Help us create a bigger database of high quality up-to-date information about Pereira. Receive credit and special recognition. And, help us to cover the costs of expanding our content platform. Sponsor a Pueblo Travel Guide. The idea is to create and publish a post for each pueblo in the coffee axis. Each post will have beautiful photos, information and content which will detail: where to stay, where to eat, where to drink coffee/tea and what to do for fun. Place Your Ad in popular articles, posts and in the popular monthly eMagazine.Reach over 120 subscribers! We will be sending information to our subscribers about new content, local events and lifestyle information about Pereira in a monthly eMagazine. Great exposure and backlink opportunity for your blog, website or small business! We have reached 1000 LIKES on Facebook only 1 year after launch! Photo taken May 11th, 2017! Edit: We will be at 1,600 by then end of April 2018.